Donald Trump spent Tuesday unapologetically defending campaign manager Corey Lewandowski after he was charged with with misdemeanor battery for an incident with a reporter at a campaign event earlier this month. “I think it’s a very very sad day in this country when a man could be destroyed over something like that,” Trump told reporters aboard his airplane in Wisconsin, where the GOP frontrunner is holding a rally. The real estate mogul said he doesn't "discard people" and that he hopes the criminal case does not hinder the role of one of his top political operatives. "I can't destroy a man. I can't destroy him. He's got a beautiful wife and children, and I'm not gonna destroy a man for that," Trump said. Lewandowski turned himself in to Jupiter, Florida, police shortly after 8 a.m. E.T. on simple battery charges for an altercation with then-Breitbart reporter Michelle Fields on March 8. 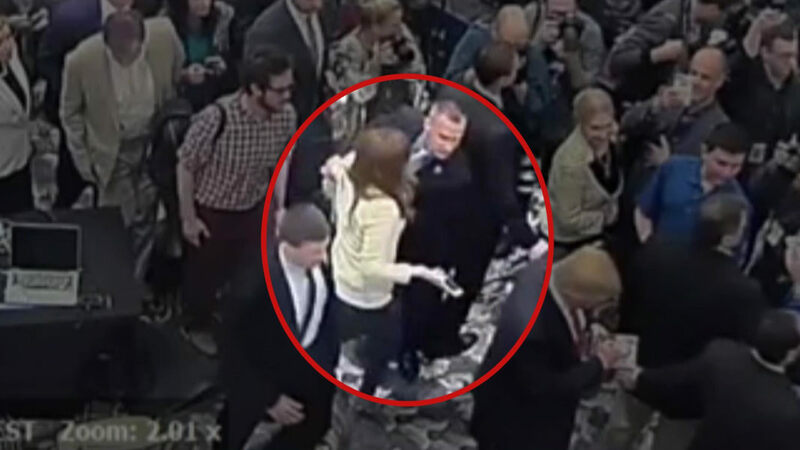 Lewandowski initially said he never touched Fields, but video released by police showed he did make contact with the journalist as she attempted to ask Trump a question. Trump said he advised his political ally he should “never settle that case” and accused Fields of changing her story once video of the incident surfaced. He said he should be the one filing charges against Fields for grazing his arm at the event and questioned bruises she said she received from the alleged yank. “How do you know those bruises weren’t there before? I’m not a lawyer,” Trump said. “My story never changed. Seriously, just stop lying,” Fields tweeted. The Jupiter Police report stated the video, along with an interview with Fields and another reporter who witnessed the event, shows "probable cause exists to charge Corey Lewandowski" with one count of simple battery. @MichelleFields you are totally delusional. I never touched you. As a matter of fact, I have never even met you. 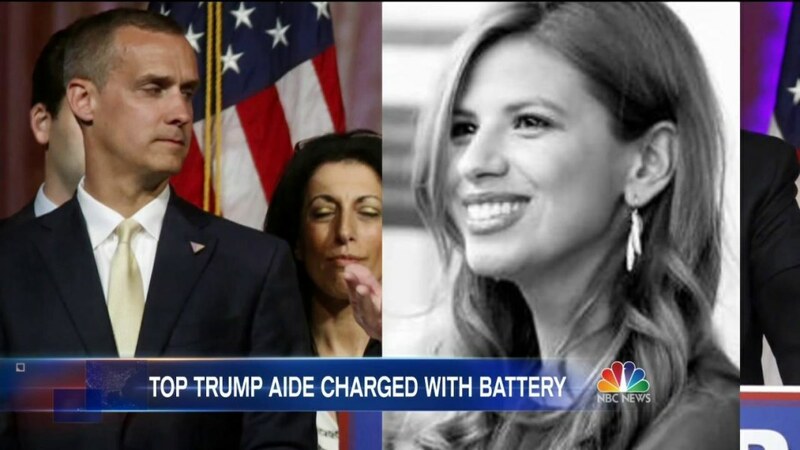 The allegations and subsequent denials from Lewandowski brought public attention to the relationship between the Trump campaign and the media, women, and violence at the Republican presidential frontrunner’s rallies. Trump has not wavered in his support for his campaign manager. Lewandowski stood just over Trump’s shoulder when the real estate mogul spoke after winning primaries in Florida, Illinois and North Carolina on March 15. “Good job, Corey," Trump said. Fields, along with three of her colleagues at Breitbart, resigned over the conservative news site’s skeptical response to her allegations. “I can't stand with an organization that won't stand by me,” Fields tweeted. "It's a very sad development and this is the consequence of the culture of the Trump campaign," Ted Cruz told reporters while campaigning in Wisconsin. "The abusive culture when you have a campaign that is built on personal insults, on attacks and now physical violence, that has no place in a political campaign, it has no place in our democracy." John Kasich told reporters, "We probably would suspend somebody. You know, it would depend what it is and what the evidence was. But when we see things that we think are inappropriate, we take action and that's what I would do and it's up to him." "That's frankly totally and completely inappropriate. It could've been one of my daughters," he later added. "I think that every candidate has to be responsible for what happens in their campaign and as I’ve said repeatedly--what Donald Trump has been doing over these last months is inciting violent behavior, aggressive behavior that I think is very dangerous and has resulted in attacks on people at his events and including this charge that was now brought against his campaign manager," Democratic rival Hillary Clinton told reporters. "I’m not gonna comment on a pending legal or criminal case but I think that you know ultimately the responsibility is Mr. Trump’s." 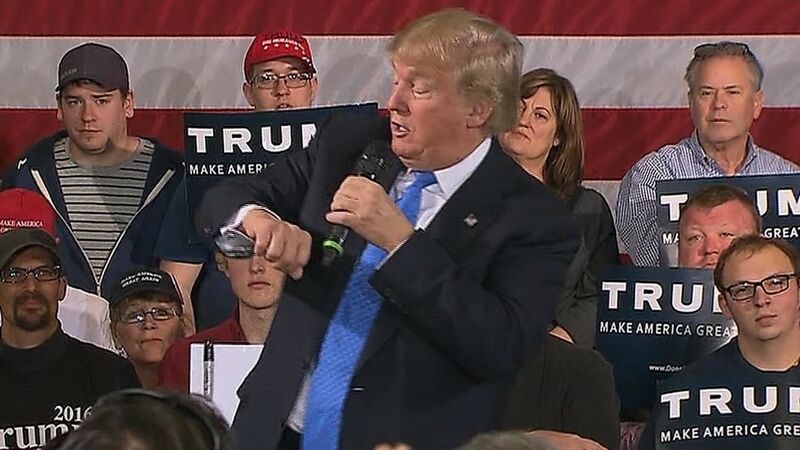 The crowd at the Janesville rally did see what happened on Tuesday – be it on Facebook or the news. And most of them had the same reaction: It was just another attempt to take down Trump. “Until we have the total facts I think the story should be cut,” Roberson said. “Things happen, I guess.” Jaime Martinez said in response to a question about charges against Lewandowski. “People are people.” But when asked if he should be fired Martinez had the same non-chalent answer: “No. Things happen."